Access to the application is available to anyone with a POCP account. If you'd like access, please create an account on POCP. If you already have a POCP account, the same credentials will work on NZGB. Welcome to the New Zealand Generation Balance website. The purpose of the NZGB is to help predict, isolate and prevent situations where available generation is insufficient to meet projected load. Communicate to industry participants potential North Island generation balance shortfalls over the next 200 days. Provide industry participants with a means of assessing the potential impact of their planned outages on the North Island generation balance. 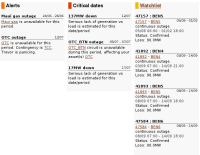 To enable industry participants to select optimum outage periods which least impact on the North Island generation balance. 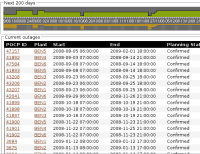 The NZGB provides significant graphical analysis of outages and load profiles, as well as various user-focused features to help analysts rapidly locate information and trends of interest. 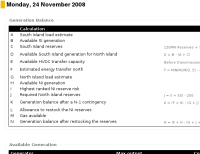 The New Zealand Generation Balance (NZGB) is calculated using estimated load and outages of generation and transmission equipment notified through POCP. 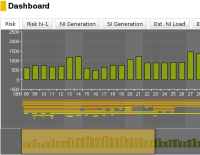 The NZGB web application automatically calculates the generation balance on a daily basis and Transpower’s System Operations Division produces a monthly report that provides additional analysis and commentary. For enquiries please contact Alex Shin.